Ladakh is where the cerulean skies are decorated with tufts of clouds and jagged mountains converse with the azure lakes below. Here, nature expresses herself in various ways, with each way stirring myriad emotions. There is no one who hasn’t nurtured a desire to visit this heavenly place. However, before visiting any place, it’s worthwhile to acquaint oneself with its various features, ranging from its history to its language, its topography to its weather. 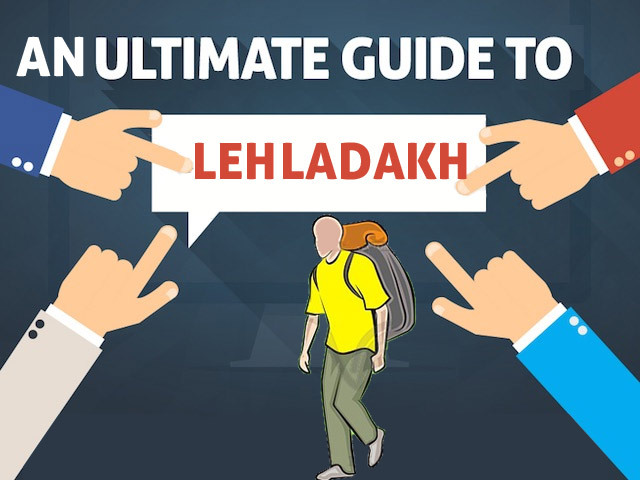 This ultimate guide for Leh Ladakh travelers familiarizes you with some great information about the “land of Passes”, Ladakh. Here, you will discover, in brief, its history, its weather, the religions which flourish here, the infrastructure, wildlife, culture and much more. You will know the best way of reaching this marvelous place, along with the kind of clothing best suited to its climate. Ladakh was an independent kingdom for nearly 900 years, from the middle of the 19th century. The kingdom reached its greatest geographical extent and attained supreme glory in the early 17th century under the rule of the famous king Sengge Namgyal. In 1834 AD, Gulab Singh, the ruler of Jammu, sent his general, Zorawar Singh, to invade this region, tempted primarily by the flourishing “shawl trade” here. However, with the ascension of the British as the paramount power, Ladakh was incorporated into the state of Jammu and Kashmir, together with the neighboring province of Baltistan. It was the withdrawal of British power and the partition which followed it, that saw Ladakh become a part of India, as a part of Jammu and Kashmir. Ladakh lies at altitudes which range from 9,000ft at Kargil to 25,170ft at Saser Kangri, in the Karakoram Range. It’s a land of contrasts, as far as the climatic conditions are concerned. Summers here can be quite pleasant as compared to the winters. The arrival of winter witnesses temperatures plummet to minus 30 degree in Leh and Kargil, and minus 60 degree in Drass. The entire region experiences subzero temperatures from December to February. However, the thin air which pervades this place intensifies the heat of the sun as compared to the lower latitudes. The main language spoken in Ladakh is Bhoti. The other languages spoken are Balti, Shina, Brokshat and Changshat. The Ladakhi language, or Bhoti, is spoken by approximately 2, 00,000 speakers in India and perhaps 12,000 speakers in the Tibet region of China, mostly in the Changthang region. The various dialects of the language are Ladakhi proper, Shamskat, Stotskat and Nubra. Ladakhi is written using Tibetan script. In schools, offices and restaurants, English and Hindi are also used. Buddhism is the dominant religion in Ladakh, especially in the central and eastern areas. The prominent presence of Buddhism is discernible from the various monasteries dotting the entire region. This region is one of the few places where Mahayana Buddhism, also known as Lamaism, is practiced. The form of Buddhism which is practiced here is a curious mixture of the animistic Bon faith and ancient Hindu tantric practices. The roots of Buddhism in Ladakh can be traced as far back as 7th century AD. Apart from Buddhism, the other major religion here is Islam, especially in the western Ladakh area, where Shia Muslims are found in a majority. There is also a small presence of Sunni Muslims here. Ladakh also has a Christian population, concentrated in the town of Leh. Tourists do not require any permit for traveling to Leh. However, all foreigners or international tourists are required to get themselves registered at Drass, Rumtse and Sarchu, especially if they are traveling by road. Those traveling by air should get their registration done at the airport. For visiting restricted areas like Tso Moriri, Tso Kar, Pangong Tso Lake, Dhahanu and Nubra Valley, tourists are required to obtain protect area permit (PAP). This permit can be obtained through registered travel agencies. One should always carry six copies of the permit with oneself while traveling, as these are required to be submitted at the checking points. One can experience drastic changes in weather while traveling to Ladakh. It should also be remembered that the temperature fluctuations here are fairly common. Thus, it becomes really very important to choose the right kind of clothing and carry the necessary essentials. Here are a few of them which you must not forget at any cost. Obviously, one should carry warm clothes, preferably woolen, while traveling to Ladakh. Planning a trip to Ladakh in summer? Pack clothes that can be worn in layers. Rather than carrying two heavy woolens, carry four lighter ones with plenty of cotton clothes. Carry multiple layers in the form of cotton T-shirts, thermals, light woolens and windproof jackets. During winters, you should be carrying plenty of thermals, heavy woolens, insulated socks, woolen monkey cap and sunglasses. The importance of wearing a windproof jacket while riding a motorcycle cannot be overemphasized. Always carry a sun hat, monkey cap or balaclava. Don’t forget to carry waterproof shoes. Do keep soaps, general medicines, towels, bandages etc. along with you. Pullovers are an absolute must. If you’re planning for camping, do carry a warm sleeping bag. Biscuits, chocolates and dry fruits can become a bliss at such an arid land. Keep torch, camera and your mobile charger handy. Bikers should keep raincoats and can also use them as windcheaters. If you are going for a bike tour in Ladakh, do pack items like puncture kit, spare tube, and break wire, etc.? Carry extra petrol with you. One of the greatest challenges to deal with in Ladakh is Acute Mountain Sickness or AMS. For this reason only, it is necessary to give your body sufficient time to acclimatize. Even the fittest person suffers from AMS and the outcome is quite obvious that the entire trip gets ruined. So, here is everything you need to know about AMS and acclimatization. Acute Mountain Sickness manifests itself through one of the following symptoms – nausea, anorexia, weakness, dizziness and lack of sleep. There are a few medicines which can help you combat the symptom. These are Diamox, Dexamethasone, Aspirin or Disprin. Therefore, you must keep these medicines with you during your Ladakh trip. One should also carry portable oxygen cylinders which are a great source of temporary relief. Along with medications, there are a few other precautions which one must observe. Being regularly hydrated and avoiding high altitude passes is extremely important. Stick to light meals and avoid smoking and drinking until you are fully acclimatized. Make sure, you rest for nearly 2 days before proceeding to explore ‘India’s Own Moonland’. Don’t exert yourself too much. When in Ladakh, always keep your cash in hand, for it may come in handy anytime! The last ATM on the Manali- Leh Highway is in Manali. After that, you won’t come across any other ATM’s until Leh. If you refuel at Tandi, you will have to pay in cash as credit cards are not accepted. In the Leh market, you will find ATM’s belonging to several banks including SBI, J&K Bank and PNB. However, in areas like Nubra, Pangong and Tso Moriri, you will have to fall back on cash for any kind of transactions. Most of the health care system in Leh revolves around the SNM hospital. Its well-equipped to deal with any kinds of problems. In other parts of the region, there are sub-district hospitals at block headquarters and medical dispensaries in major villages which are attended to by well-qualified doctors. In addition to these, private clinics and associated facilities are also available in Leh. In case of emergencies, the Army’s General Hospital at Leh also attends to tourists in case of emergencies. Several chemist shops are also found around the SNM hospital, along with a few in the main market. It’s advisable to carry your prescribed medicine with you. In case of any difficulties, it’s always advisable to contact the police station in Leh, which falls under the jurisdiction of Jammu and Kashmir police. Nubra Police Station in Nubra Valley and Nyoma Police Station in Nyoma are other police stations one can contact in case of any distress or difficulties. Leh airport, which is also known as Late Kushok Bakula Rimpochee Airport, is named after the respected Kushok Bakula Rinpoche. This domestic airport, located at an altitude of 10,682ft, is considered to be the highest of its kind in the entire world. Hand baggage is not permitted at this airport due to security reasons. This airport is well-connected with all the major cities in the country. Some of the most famous tourist destinations in this region are, Leh, Drass, Kargil, Hunder, Suru Valley, Shyok Valley, Padum and Jispa, among others. Ladakh is scattered with various tourist attractions, and each one of them is special in its own right. From monasteries to passes, from culture to adventure, excitement comes in an interesting package here. Here are some of the most famous tourist attractions worth checking out. The most famous lake in Ladakh is Pangong Tso, about 160km from Leh. Tso Moriri, situated at an altitude of 15,075ft, is the largest of the high altitudes lakes in the trans-Himalayan bio geographic region. The other famous lakes of the region are Tso Kar, Mirpal Tso, Chagar Tso, Kiagar Tso, and others. Ladakh is blessed with several monasteries, most of them dating back to ancient times. One of these is the Hemis Monastery, which also hosts the Hemis Festival. Thiksey Monastery, with its 49ft Buddha statue, is another famous monastery. Other monasteries worth checking out are Diksit Monastery, Likir Monastery, Spituk Monastery and Stakna Monastery, besides others. One can find rare species of wildlife, ranging from exotic animals and birds species in Ladakh. Several bird species can be witnessed at high-altitude wetlands like Lake Tso Moriri. Snow leopards are a major attraction here. Hemis National Park is another place for exploring the wildlife of the region. The topography of Ladakh offers ample scope for adventurous activities. Trekking is best experienced at areas like Spituk to Markha Valley and Hemis Gompa via Kongmaru La. Some of the most challenging peaks for mountaineering are Stok Kangri Peak, Kangyaze Peak and Nunkun Massif. White water rafting on the Zanskar River and camel safari across the sand dunes around Hunder are immensely popular with tourists. Ladakh also witnesses a number of cultural events and festivals the year round. One of the most famous of these is the Losar. Sindhu Darshan, celebrated on Guru Purnima, is another famous festival. Stretching over two days is the Hemis Tsechu, an event marked by mask dances. Yuru Kabgyat and Phyang Tsedup, besides others, are also celebrated with pomp and enthusiasm. Ladakh offers a variety of accommodations suited to every traveler’s needs, ranging from hotels to homestays to camps. Further, one can select one’s accommodation depending on one’s budget. Most of the hotels in Ladakh are family run establishments and the services offered are more personalized than professional. The category of hotels here range from Luxury, Deluxe to Standard. Some of the best luxury hotels are Hotel Charu Palace Leh and Grand Dragon. Deluxe hotels worth checking out are Hotel Shangrila and Spik n Span. Standard Hotels include Hotel Asia and Hotel Dreamland, among others. The best way of getting acquainted with Ladakhi people and their hospitality is opting for a homestay. Some of the best homestays in the Leh Ladakh are Gangba Homestay, Gangs Shun Homestay, Ladakh View Homestay and Tukchu Homestay, including others. Nothing is as exciting as camping in Ladakh. Proper camping sites are only available near Sarchu. With your own gear, you will find plenty of space to camp after crossing Rohtang. Two of the best camping sites are Lake Pangong Tso and Tso Moriri. Which Route is Good for Ladakh? The route from Manali to Leh is always the preferred one primarily due to the fascinating landscapes that it presents, along with miles and miles of isolation. Manali to Leh is a two lane highway, with its highest elevation point being 5,328m and extending to 490km in length. The Srinagar to Leh highway, also known as NH ID, is considerably shorter and goes through friendly terrain. This 440km long highway passes through the scenic valley of Kashmir and Sonamarg, takes you to Zoji La heights, and to the towns of Drass and Kargil, before finally arriving in Leh. Leh Kushok Bakula Rimpochee Airport is the main airport of this region. Flights operated by Air India, Go Air and Jet Airways are directly connected from Delhi, Srinagar and Jammu. There are two ways of reaching Leh Ladakh. One is the Srinagar to Leh route, which reaches Ladakh from Kashmir Valley through Kargil. Manali to Leh route, extending to 473km, is another way of reaching Ladakh. The road passes through the desert plateau of Rupsho along with other high passes. The nearest railway station to Ladakh is Jammu Tawi, which is located about 700km from Ladakh and is well connected with Delhi, Kolkata and Mumbai. Most of the dishes found in Ladakhi cuisine originate from the produce of the fields and farms of the people. Both vegetable and meat, along with their various varieties, form a part of the cuisine here. Thukpa, Skyu, Khambir and Pava are the staple food of the people here. Apart from the staple food used in all meals, some of the most famous vegetarian dishes are Tsap Thuk (soup made from germinated barley flour), Thud (butter and dried cheese brick), Sku (traditional Ladakhi dish from wheat flour in vegetable broth), and Thukpa (spicy soup with hand-rolled noodles), among many others. Bedsides these, lotus root is another specialty here. One of the popular dish you will come across is Ladakh is Tigmo, which is a form of fermented and steamed bread, served with non-vegetarian stew. Momos, stuffed with pork, are an all-time favorite of the people here. Other famous dishes include Tabaq Naat (made of fried ribs), Roghan Josh (the juiciest curried mutton), and Gushtaba (pounded and spiced meat balls). Summer season is best experienced in Ladakh between the months of August to late September. Roads are clear, accommodations quite affordable and nature’s beauty is at its zenith during this time of the year. During winters, which last from October to March, much of Ladakh is covered with thick snow, thus making the conditions around quite dangerous, and the roads inaccessible. We hope you have obtained all the necessary information related to Leh Ladakh. If your curiosity has been aroused enough, and you yearn for a trip there, check out the our list of holiday packages for Leh Ladakh available at our website. Experience the most amazing sites of Himalayan Beauty!